I've just learned that Aaron Eckhart, the eternally underrated actor from films like The Dark Knight, Erin Brokovich, and most recently the ill-fated I, Frankenstein, is gearing up for another transformative role as real-life boxing trainer Kevin Rooney in the film, BLEED FOR THIS. 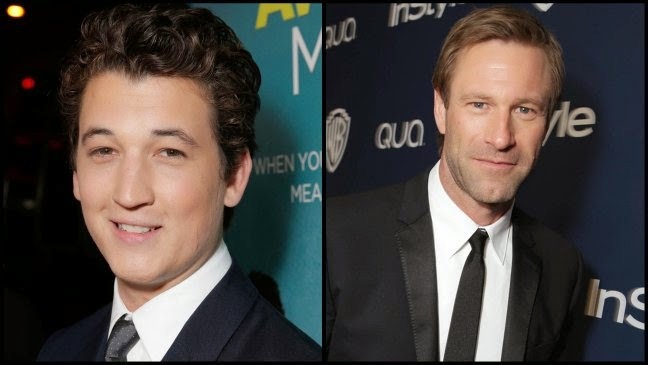 He'll join Miles Teller (The Spectacular Now, Divergent), who will play 5-time world champion Rhode Island boxer Vinny Pazienza, in the film that is to be written and directed by Ben Younger (Boiler Room). According to the press release, the film will focus on Pazienza as he recovers from a near fatal car accident that left him with a broken neck. He then goes on to win three additional world boxing titles, one of the most incredible and dramatic comebacks in sports history. Rooney apparently was a big influence in inspiring Pazienza to get back into the ring and changing his boxing style, which led him to become one of the only two boxers ever to win titles in both lightweight and junior middle weight class in 1991. I know, I know. I try not to lump all these boxing films together, but this all sounds very familiar. But judging by the amount of accolades and box office tickets, Hollywood--and audiences--love a good fighter story. Hopefully this one gives us a little something different. At any rate, BLEED FOR THIS can definitely be a career-making role for Teller, who hasn't impressed me so far in others performances I've seen from him but maybe he'll win me over in this film. Based on pictures I've seen of both real-life figures, he and Eckhart favor some of their physical characteristics, so it would just be a matter of bringing everything else to the role. What I am most excited about is the return of Younger who, despite his impressive Boiler debut 14 years ago has almost exclusively helmed short film projects (with the exception of Prime and an Army Wives episode most recently in 2007). I am hoping this will be one of many more projects for him. The project will start filming this September with a slated release in 2015. Others on the production team include Martin Scorsese and Emma Tillinger Koskoff (The Departed, The Wolf of Wall Street), Bruce Cohen (American Beauty, Silver Linings Notebook), Noah Kraft (Loosies), award-winning Rhode Island producers Chad A. Verdi and his wife Michelle (Loosies, A Bet's a Bet, Bad Hurt). Thoughts on the project? Share them in the comments box below.